The Department of Public Expenditure and Reform confirmed that the card will be needed to apply for a passport from autumn of this year. CONCERNS HAVE BEEN raised that the government is attempting to introduce a national identity card “by stealth”. This comes after it was confirmed that anyone applying for a passport or driving licence in the future will need to have a public services card. 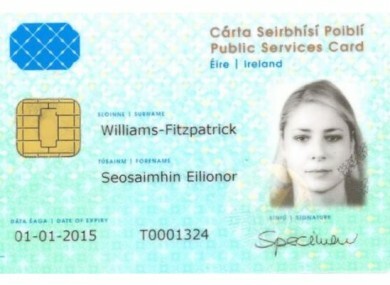 The public services card (PSC) was first introduced in 2012 and rolled out to people getting social welfare payments. Since its introduction, the State has been expanding the services for which it is needed. Last year, it became necessary for all first time passport applicants under the age of 18 who are resident in Ireland to have a Public Service Card. It also became a requirement for all applicants for a certificate of naturalisation aged 18 or over to have a card. Following an article today in the Irish Times, its been announced that anybody applying for a passport for the first time or renewing their passport will need to have a Public Services Card from this autumn. A PSC will also be needed for anyone applying to take their Driver Theory Test from June. Anyone applying for a driving licence will also soon be required to have a PSC. Speaking this morning on Newstalk Breakfast, data-protection expert Darragh O’Brien said that the PSC was creating a national identity card “by stealth”. “The creation of a national identity card is being done by stealth without appropriate debate and transparency,” said O’Brien. One of the reasons there is concern around this is that the amount of sharing of data that has to happen in various government departments to ensure this card exists is quite large. In a statement, a spokesperson for the Department of Public Expenditure and Reform said that the card was the most effective way to “enhance protection against fraud and identity theft and to uphold the integrity of the Irish passport”. “Furthermore, the use of the PSC to access public services is a fundamental enabler for the protection of personal data, ensuring the use of such data is accurate, minimised, transparent, and in line with data protection principles,” they said. The spokesperson denied that it will ever become compulsory to have a PSC. “However, Government has an obligation to deploy the most robust means of online and physical identity verification possible to ensure that it is doing all it can to reduce fraud, personation and the risk of identity theft in the delivery/accessing of public services,” they said. In relation to people living in Northern Ireland, the spokesperson said that there are over 100 Intreo offices in Ireland where people can go to apply for the PSC. “Many of these will be convenient to Northern Ireland residents, should they choose to use them,” the spokesperson said. Email “Applying for a passport or driving licence? You'll soon need a Public Services Card to do so”. Feedback on “Applying for a passport or driving licence? You'll soon need a Public Services Card to do so”.